We needed a special ruling in 2015 to dig up two teams to promote from the Fourth Division. As a result, the Chicago White Sox finally have escaped. along with the New York Mets. The Fourth Division is always a little difficult to figure, and the 2015 race even required a special ruling. We dislike special rulings and hope to have everything covered in the rules, but new contingencies arise in new enterprises like this. The problem with the Fourth Division is that it's desirable to promote two teams (that is, after all, the practice), but the Fourth Division often doesn't have two teams that can make a strong case for promotion. Quite often, one team will wipe out the Fourth Division and leave no one else with a winning record. With only six teams in the Fourth Division, games already are harder to come by, and the 2015 six came from five different Major League divisions. In the larger and higher divisions, there is more crowding and more games because of it. So, in those divisions, it is required that no team can be promoted without at least 10 wins, no team can be demoted without at least 10 losses, and any team being promoted or relegated must face at least three other teams within that division. In the Fourth Division, being smaller, we say its necessary to play at least two of the other clubs in the division. What of the win requirement? The 10-win requirement never was really tested until the end of 2015. Until then, we said that a team that doesn't win 10 within the Fourth Division can't be promoted unless it has won at least 70 percent of its games and there is no other team with at least 10 wins and at least a .500 record to be promoted in its place. Ending 2015, though, neither of those conditions held. So, we had the Chicago White Sox, 8-4 in the Fourth Division and clearly the leading team. If the White Sox had just won one more game to go 9-3, there would be no decision here, but 8-4 is just less than 70 percent. It's murky in the Fourth Division, and it's hard to get out of there. The Baltimore Orioles and Pittsburgh Pirates were in the original Fourth Division in 2010 and it took them each three years to escape. The Kansas City Royals were a Fourth Division original needing four years to escape. The Houston Astros fell to the Fourth Division in 2011 and they're still not getting out. The White Sox fell to the Fourth Division in 2012 and they're just now getting out with a special ruling. The Orioles and Mets are original Fourth Division clubs that found their way out and back. In 2014, for example, the Orioles were in the Third Division, battling with the Kansas City Royals for promotion to the Second Division. But when the two clubs met in the American League Championship Series, the Royals won a four-game sweep, pushing themselves up to the second tier and pushing the Orioles back into the Third Division basement and demotion back to the Fourth Division. The Royals are moving up to the First Division in 2016 after splitting the Second Division title in 2015. Meanwhile, the Orioles are doomed to another Fourth Division season in 2016. Elsewhere in the Fourth Division, the New York Mets are 16-13 in 2015, clearly receiving a promotion to the Third Division in 2016. But the Mets were the second-place team (.583). What about the first-place team? Who would you promote instead of the White Sox? In third place, we had the San Diego Padres, 9-7. They present the same questions as the White Sox, except their record isn't as good. In fourth place, we had the Houston Astros, 8-8, hardly the breakout season we have seen in the Major League race. Next down, it's the Miami Marlins at 12-17 and the Baltimore Orioles at 8-12. Can't promote either of them. 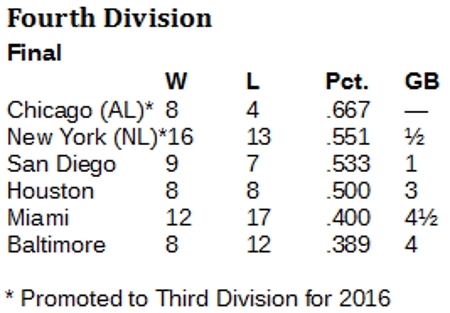 So, the White Sox will join the Mets in promotion. And the promotion policy will remain as stated above, with one addendum: If there is no team with fewer than 10 wins and a winning percentage of 70 percent or better, and there is no team with at least 10 wins and a .500 record, then a team with fewer than 10 wins and a winning percentage of .600 or better will receive preference for promotion. A rule change, which is being considered, would lower the promotional requirement to eight wins within the Fourth Division. Supporters of the change say it would be a more realistic measure of promotional merit in a smaller division. Opponents say the 10-win requirement promotes excellence. We're not sure what promoting excellence is supposed to do with the Fourth Division, but we cite the Oakland Athletics, who were 25-7 in the Fourth Division in 2013. No one else in the Fourth Division had a winning record that year and the second promotion went to the Royals, who were 17-17. So, the A's and Royals went to the Third Division in 2014. And it was interesting how the Third Division shook out in 2014. Pittsburgh came in as the clear winner at 25-11. At the end of the regular season, Kansas City was second at 11-10, but the A's (17-17) were right there, as were the Orioles (13-14). As it happened, the American League playoff race took the Athletics to Kansas City for that year's wild card game in the American League. The Royals won, as everyone knows, and they later swept the Orioles, dropping them to last place in the division at 13-18. So, with that wild card game, the fortunes for the Royals and A's changed a lot. The A's came back in 2015 as the last-place team in the Third Division, which means their immediate future is somewhere down below. They will be joined in the 2016 Fourth Division by the Colorado Rockies.